Available in three colors, these Polyshell Stacking Chairs from National Public Seating are a smart and stylish choice for art rooms and other educational spaces. Sturdy and lightweight, they're easy to maneuver for temporary setups yet can also handle the rigors of long-term institutional use. 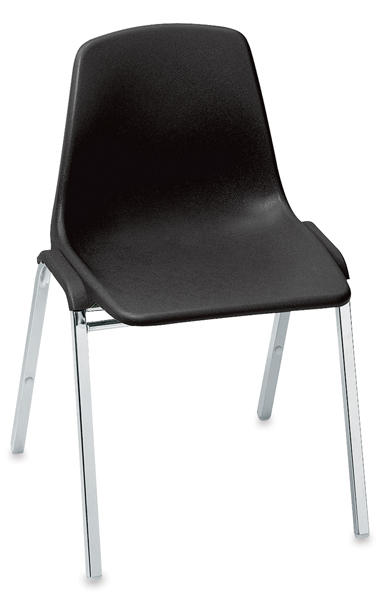 The anti-static, one-piece seat is made from injection-molded, high-density polypropylene. The 17 gauge, 7/8" (2.2 cm) square tubular chrome frame has three under-seat cross braces for extra stability and bumpers that protect the finish when stacked. These chairs may safely be stacked 12 high. They measure 31"H × 19¼"W × 19¼"D (79 cm × 49 cm × 49 cm).